Do larger mammals take longer to urinate than smaller mammals? When I was a young schoolboy, I well remember a teacher, when describing Roman religious practices, coming up with the killer line that he had never seen an auspice. How we all roared! Now that I am a mature adult I have seen a horse piss and a prodigious quantity of steaming urine they produce, to be sure. I have also had the privilege of watching many other species of the animal kingdom passing water. I don’t know if it is just serendipity or whether the sight of me causes them to micturate. Anyway, I have long wondered whether it takes a creature the size of an elephant longer to urinate than a horse, for example. It is these sorts of questions, I find, that nag away at you and which this series is intended to answer. Help is at hand from some research conducted at Zoo Atlanta in Georgia and published in the ever popular Proceedings of the National Academy of Science. The researchers, who assuming that because creatures like a rhino have bigger bladders than a dog, thought that the animals with larger bladders would take longer to go about their business and set out to prove this by installing high-speed cameras to capture their performance. Thirty two species ranging in size from a mouse to an elephant including jaguars and gorillas were tested. The findings were fascinating. It wasn’t the size of the animal’s bladder that was the key determinant but their overall size. The tipping point for mammals is a weight of 6 lbs. Despite an elephant having a bladder capacity of 18 litres compared with a cat’s of 5 millilitres, all mammals with a weight in excess of 6 lbs urinated on average for 21 seconds, give or take. It is all down to flow rates, apparently. An elephant can urinate faster than a cat because its urethra is wider and longer, allowing the force of gravity to act more strongly on fluid flowing through it. Creatures with weights below 6 lbs, on the other hand, have urinary tracts that are so small that they have to battle against capillary action – a tendency for the urine’s molecules to stick to themselves and the walls of their tracts and flow back up again. Instead of producing a stream of urine, their pee is so viscous and moves so slowly that it falls out in droplets. Fascinating stuff and useful too. If you are unfortunate enough to be stuck in a shower of elephant urine, at least you now know that your ordeal will last around 21 seconds. Makes it seem almost bearable! It may have escaped your notice but this year marks the centenary of the outbreak of the First World War. The story behind the tragic unravelling of the complex treaties and security pacts which were designed to promote and guarantee peace but precipitated the major powers into a bloody and catastrophic conflict has given many a historian fruitful ground to examine the causes, to lay blame and point out lessons for the future. So extensive is the literature around the First World War (and the centenary has prompted another flurry of works on the subject) that you would think it would be impossible to come up with a new angle on what for all its tragic qualities is now fairly hackneyed ground. 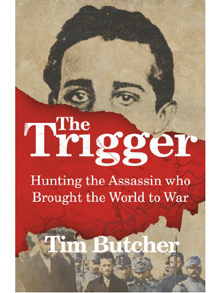 Tim Butcher’s quirky and engaging book, The Trigger, does just that, focussing on the man whose trigger finger was the catalyst which plunged the major European powers into war, Gavrilo Princeps. The book starts out with Butcher wondering why Princeps is almost a forgotten man in his homeland, Bosnia, something brought home to him when visiting Princeps’ tomb which was being used as a carsey and was covered in graffiti. The book is part history, part travelogue – Butcher follows Princeps’ journey from rural Obljaj, where he meets some of the assassin’s surviving relatives, to Sarajevo and Belgrade. As well as putting some colour to Princeps’ rather sketchy and short-lived life – he was too young to be hung following his arrest and languished in jail for four years before succumbing to a fatal bout of tuberculosis – Butcher, a former newspaper correspondent who covered the Bosnian war in the 1990s, explores what led to the radicalisation of a boy who was an earnest and studious pupil and what happened subsequently to his homeland. The Bosnian killing fields of the 1990s became the training ground for the first wave of Moslem radicals and was where the Western powers (eventually) got the taste for dropping bombs on people. Princeps was clearly a dreamer who was bookish and became increasingly more angry when he moved from the area of his birth – vukojebina which means where the wolves fu*k – to the major towns and realised that the poverty that was his family’s lot was not unique to his area. It fed a growing hatred of the occupying powers. Although Princeps has been painted as a Bosnian Serbian nationalist (and this is why now he is now reviled amongst the Croats and Moslem communities in the country) Butcher argues that he was a South Slavic nationalist, explaining why he was embraced by the Tito regime. It is a bright and breezy book and mixes the quest to discover the real Princeps with an attempt to explain the Bosnian conflict and, more importantly, its consequences. Butcher sees the indie group, Franz Ferdinand, play a concert at Banja Luka where they project an image of Princeps on to the back drop of the stage. Hardly anyone in the Serb audience knows who he is. If nothing else, understanding what led to the radicalisation of a quiet studious boy is du jour and worth adding another tome to the First World War literature. Just as the earth constantly revolves around the sun (if you believe this revolutionary theory) so, it seems to me, trends, fashions and social mores follow a similar trajectory. Never throw away your fashion items, I say; they will eventually come back into fashion. And there is a certain and pleasing circularity in our working patterns and habits. The nascent café culture of the late 17th century famously spawned the leviathan of the insurance industry that is Lloyd’s of London. That insurance exchange began in a coffee shop opened by Edward Lloyd in 1688 on Tower Street, where members of the shipping industry – sailors, merchants and ship owners – gathered to sample the delights of a cup of coffee and a gossip. It was there that they struck deals including ways of reducing their risks through insurance and the enterprising Lloyd also provided them with a source of reliable shipping news. The shop relocated to Lombard Street just after Christmas 1691 and carried on its maritime arrangements long after the eponymous owner’s death in 1713 until a committee was established and moved everything to the Royal Exchange in Cornhill and established the Society of Lloyd’s. According to a survey published by O2 Business transacting business in coffee houses and other dens of iniquity is back in fashion. Around 40% of British workers reported that they spent four hours a week working in cafes. Eight per cent of the respondents claimed to do some work in a pub (I assume that these are not publicans and bar staff) while 6% work while on a bus and a further 5% transact some form of business in the back of a taxi cab. An indolent 10 per cent of respondents claim that they have worked from their bed and an energetic subset of 7% claim to have done some work for which they are remunerated in a gym. British workers, according to the survey, spend 131 million hours a week working in coffee shops and 26% of the respondents said that this would be where they would prefer to work if their employers adopted a more flexible approach. And why not? If your job is not location dependent, unlike teachers or nurses for example, the developments in modern technology such as improved communications out of office locations through smart phones, tablets, Blackberries and the like means that there is no real reason why many workers need to be tied to their desk throughout their working week. In so-called people business – financial services in general and insurance (at least as transacted in the London market) – much business is already done in pubs, bars and coffee shops. By being able to keep in touch with what is going on at the ranch efficiency (assuming you have not imbibed too much of the grain or grape) can be enhanced. Employers who provide workers with mobile technology expect them to be responsive around the clock. The trend towards hot desking forces employees to be more creative in where they do their work. If you can be as productive lying in bed or beside a pool, then why not take advantage of it? We are now in the era where employers must consider reasonable requests for flexible working arrangements specific legislation was enacted on 1st July. But really all that is happening is that the circle started by Edward Lloyd has been completed. It is a bit galling to be pulled up by a two and a half-year old but that is what happened to me the other week. There I was playing my Lord Chesterfield role sitting with the BoJ, going through some numbers with him, in the misguided belief that having a basic grasp of the decimal numeric system will stand him in good stead when he goes to school. Seeing the mental gymnastics that so-called students and graduates serving behind the bar of our local pub perform when called upon to subtract one number from another – I won’t go into their ability to then work out what coins of the realm make up the change from the proffered note –his grasp of some basic maths can’t come too soon. Anyway, we were sitting going through a series of symbols representing quantity when we came to that tricky round one that represents nothingness. I ventured to suggest that it was a nought. ”No gandad”, quoth he – charmingly, the combination of g and r have so far eluded his pronunciation skills – “it is not nought, it is zero”. Whilst admiring him for his precociousness, was he right? It all comes down to the difference between digits and numerals. Under our Arabic numeric system – so much easier than the rather clunky Roman numbering system, I find – we have ten digits running from 0 through to 9. Any number we choose to represent is made up of a sequence of these digits and the sequence may consist of just one digit – as in 9 – or a series of digits – as in 1,674. The problem is that we have conflated the nomenclature for digits and numbers. So the word two is used to signify both the digit two (which is a basic component of a whole series of numbers) and the number two which sits between the number one and three. This conflation applies to all the digits in the range 0 to 9 EXCEPT for the symbol for nothingness. Nought – note the spelling, naught is an Americanism – is the name ascribed to the digit 0. The word zero describes the number 0. So if you are using it in the context of nothingness as in there are no sweets left, then it would be correct to call the symbol zero as it is being used as a numeric. However, if you were naming the component digits in a number – say 60, which, coincidentally we were – then the correct designation would be nought as the 0 is being used as a digit. So there we are. Still, I admire his self-confidence and remind myself that the ability to distinguish between a digit and a number, particularly when 90% of the time we lazily conflate the nomenclature of the two into one, is probably beyond the grasp of even the apple of the eye of a doting gandad. Verily, the Lord moves in mysterious ways, his wonders to perform. Prionda Hill from Fort Wayne in Indiana was arrested after running over a motorcyclist in her car. Apparently immediately before the accident God told the motorist that he would take over and so she let go of the wheel and sat back. Unfortunately, the Lord, who being an Englishman may have been confused by the left hand drive or else may have been momentarily distracted by more pressing concerns, proceeded to drive straight over Anthony Oliveri, heading in the opposite direction. The unfortunate cyclist suffered broken ribs and a damaged spleen and kidney. Astonishingly, Oliveri, at the moment of his crisis, also took comfort in the Lord, saying to himself as Hill’s bumper loomed towards him that if that was the way that God wanted to do it, then that is the way we are going to do it. What it is to have God on your side! It is always difficult to know what is a fitting memorial for a loved one or an iconic figure. There is a lot to be said for choosing something environmentally friendly, green and sustainable. But this comes with its own dangers as this delicious story from L.A shows. A pine tree sapling was planted in Griffith Park in LA in memory of the former Beatle, George Harrison. Harrison spent his last days in the city before his death in 2001 and was a keen gardener. By 2013 the sapling had grown to around 10 feet tall. So far, so good. Unfortunately, it was reported this week that the tree had died, having been infested by – yes, you guessed it – beetles! As the guitarist so eloquently put it, “For the forest to be green, each tree must be green”. Quite! A new tree is to be planted. To be in fine fettle is to be in good condition (generally if used in relation to objects) or in good health (if used in relation to yourself or other humans). The alliteration makes it a pleasant idiom. But what is a fettle and where did the phrase come from? The origin of the word fettle is fairly obscure and, as is often the way with these things, there is no definitive answer. It is thought that it owes its origin to the Old English noun fetel which is a belt and which itself derives its meaning from the German fessel meaning a chain or band. So, probably, the original sense of the noun was to convey the sense of girding yourself up, summoning up energy as if for some task. Fettle as a verb has survived in certain regional dialects. In the north of England speakers use it in the context of repairing or making something. In Australia a fettler is a railway maintenance worker, repairing and putting back in order the railway tracks buckled by the Aussie sun. It has also survived in some manufacturing industries. In metallurgy the process of cleaning metal castings by knocking and scraping off unnecessary projections on the surface of the cast is known as fettling. 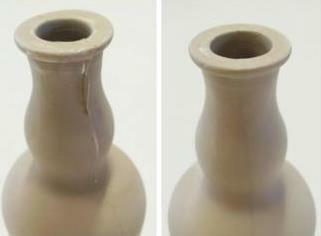 In ceramics the process of fettling involves the removal of two seam lines left after joining two moulds. It is undoubtedly this sense – where something which is initially imperfect is improved in condition – that lends itself to this quaint English idiom.